Everyone’s worst nightmare became a reality Monday night when Dallas Stars’ Rich Peverley came off the ice and collapsed on the bench during the first period against the Blue Jackets. Thankfully, Dallas officials have released that Peverley is now in stable condition. Praying for Rich Peverley and his family! Everyone take a moment to think about our dude rich peverly…what a warrior! Our thoughts are with Rich Peverley. Hearing he asked "how much time was left in the period" when he woke up. Hockey players everyone. Our thoughts and well wishes go out to Rich Peverley, his family and the @DallasStars organization. Our thoughts and prayers go out to Rich Peverley, his family, as well as the @DallasStars. Our thoughts are with Rich Peverley and the @DallasStars. Our thoughts and prayers go out to the @DallasStars and Rich Peverly. Our thoughts and well wishes are with Rich Peverley and the @DallasStars. The @Celtics organization's thoughts are with former @NHLBruins forward Rich Peverley and the @DallasStars tonight. Our thoughts and prayers are with Rich Peverley and the @DallasStars tonight. Stay strong!! Sending our best from Ottawa to the @DallasStars and Rich Peverley tonight. @DallasStars our thoughts and prayers are with you guys. Wishing the best for Rich and his family right now. Our thoughts and prayers are with Rich Peverley and the @DallasStars tonight. 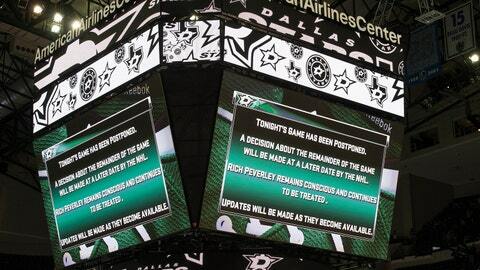 Our thoughts and prayers are with Rich Peverley and the @DallasStars. / Nos pensées vont à Rich Peverley et aux Stars de Dallas. Our thoughts and well-wishes go out to Rich Peverley and the @DallasStars. We join the NHL and hockey community sending our thoughts and prayers to Rich Peverley and his family. Our thoughts are with Rich Peverley, his family and the @DallasStars tonight. Our thoughts are with Rich Peverley and the @DallasStars organization. Best wishes for a speedy recovery. We join the rest of the hockey community in sending our thoughts and prayers to Rich Peverley, his family and the @DallasStars organization. I hope Rich Peverley is ok. Scary incident in the Dallas game tonight. Positive thoughts and prayers from all in our Organization. Very scary moments tonight in Dallas. All of #OilCountry's thoughts and prayers are with Rich Peverley, his family and the @DallasStars. Count us among those wishing Rich Peverley, his family and the Stars all the best. Always such a tough competitor. Before we start the 2nd … Sometimes hockey isn't all that important. Thoughts to the @DallasStars, Rich Peverley and his family.
.@DallasStars Our thoughts are with your team. Wishing Rich Peverley all the best and a full recovery. Our thoughts and prayers are with Rich Peverley, his family and the Dallas Stars organization. We are praying for the best. Times like these, we all pull for the same team. Our thoughts are with Rich & the @DallasStars tonight. Hockey family. Thoughts and well wishes tonight are with Rich Peverley and the @DallasStars. Thoughts and prayers from the @VanCanucks and everyone at #Canucks Sports & Entertainment go out to Rich Peverley and his family. Our thoughts are with Rich Peverley and the @DallasStars. Hoping he makes a speedy recovery.